Theresa May is facing a showdown with pro-European Tory MPs after the Lords overwhelmingly backed plans to give parliament a “meaningful vote” if no deal is reached with the EU. The British government was defeated by 119 votes after a Conservative peer tabled an amendment that ministers believe will undermine Brexit by tying the Prime Minister’s hands in negotiations. The defeat sets up a clash between the government and pro-European MPs led by Dominic Grieve, the former attorney general, when the EU (Withdrawal) Bill returns to the Commons tomorrow. About 14 Tory MPs are prepared to rebel against the government, which is refusing to accept the Lords amendment because it believes it would effectively enable parliament to direct talks. Last week, Mrs May headed off a rebellion by making “personal assurances” to a dozen rebels that she would address their concerns over parliament being given a meaningful vote. But when the final amendment was tabled it made clear that the Commons would only be able to pass a motion saying that it had “considered” the matter, which critics said rendered the meaningful vote “meaningless”. In the Lords yesterday, Viscount Hailsham – the former Conservative Cabinet minister Douglas Hogg – tabled an updated version of the amendment by Mr Grieve that was rejected by the government. Lord Hailsham was embroiled in the MPs’ expenses scandal after he charged the taxpayer to clean the moat at his house. David Cameron elevated him to the Lords in his dissolution honours list despite having to withdraw a previous nomination on the advice of a watchdog body. During angry exchanges in the Lords, which were watched by Mr Grieve, Lord Hailsham claimed Brexit was a “national calamity”. Lord Robathan, a pro-Brexit Tory peer, accused his colleague of wishing to “destroy Brexit” and said his intervention was all about “sabotaging” the UK’s departure from the EU. One peer was overheard calling him an “idiot” as he made the comment. Lord Howard, the former Conservative leader, said that the amendment would “confer upon parliament a negotiating power which has always resided in the hands of the executive in our country”. Despite the warnings, 22 Tory peers backed Lord Hailsham’s amendment, a rebellion which is likely to embolden MPs in the Commons. 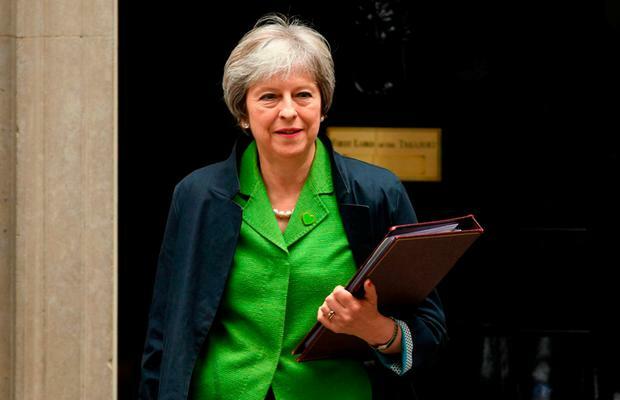 The Prime Minister said that she had been listening to the concerns of critics but the legislation must not restrict her freedom in talks with Brussels. “As we keep faith with people who voted to leave the European Union, and many of those who didn’t but are now saying ‘let’s just get on with it’, we need to make sure we are putting this legislation into place,” she said. Mr Grieve insisted rebels would only accept a “meaningful vote” and not the “slavery clause” offered by the government.